CoasterNick3157 wrote: whatever six flags is planning for 2019 it will not be expensive over 20 million for a ride so please stop coming up with these dumb ideas of a duel racing coaster or launch coaster lets be real here its six flags not cedar fair. Everyone is entitled to their own opinion. Magic Mountain is speculated to get a $20 Million coaster, it may not be outside of the realm of what we could get. Unlikely, but possible. Not sure if that "dumb" statement was directed at me, but I can come up with any "dumb" idea i please actually. Not hurting anyone to speculate, no matter how far out of the realm. We're trying to decipher the teaser here, so if you already know what it will be, then maybe enlighten us, other wise, we'll keep the guessing game going! Has anyone thought about this... the fact vekoma has been building some racing themed launch coasters? With excellent reviews I might add. Does anyone think it is out of the ballpark that we could get a vekoma launched coaster? Would be something none of the other parks have and Great America has been known for that. Just my thoughts but I am still not convinced to ruling out water park. S&S built hypersonic. People hated it. Kings Dominion took it out. S&S built the Joker ride, and people are disappointed by it. S&S was with X2 (after Arrow first built it), and that ride has so many maintenance problems. Expect more maintenance problems with this thing, if this is what it is. With 3 can shakes, it could mean 3 launches. Don't think you're getting 3 launches with a pneumatic style launch. It would have to be LIM/LSM. Revi wrote: Has anyone thought about this... the fact vekoma has been building some racing themed launch coasters? With excellent reviews I might add. Does anyone think it is out of the ballpark that we could get a vekoma launched coaster? Would be something none of the other parks have and Great America has been known for that. Just my thoughts but I am still not convinced to ruling out water park. I brought up Vekoma earlier in the thread. I'd love to see a traditional looper like Lech Coaster, but Energylandia's launcher looks nice as well. Last edited by Muck Finnesota on August 5th, 2018, 5:54 pm, edited 2 times in total. A launch coaster could be well under $20m so it is not a dumb or unrealistic idea... the dueling racing concept, I think is a bit much, but hey people are entitled to their own ideas. I love the vekoma launch rides that have been coming out recently. I would rather have a Vekoma launch than a S&S. Something like the Top gun or the one at Energylandia would be awesome. Alright.... just give me the next teaser now. The suspense is killing me. The new Vekomas look really smooth and far superior to the older models. That Lech coaster in Poland is getting nothing but great reviews and it only cost $5 Million. Those Bermuda Blitz models would be perfect for smaller parks like the Great Escape or Six Flags America. While on the topic of Vekoma- Formula looks like a family coaster compared to this one. ^ While that is true, any Vekoma launch would be a win in my books. If they follow the same pattern from the last few years, we should be seeing the next teaser Thursday. That’s too late!! [FACE WITH TEARS OF JOY] when it ends up bein water park related, I’m already ready to read the 22 pages of s*** talk. gottastrata33 wrote: That’s too late!! [FACE WITH TEARS OF JOY] when it ends up bein water park related, I’m already ready to read the 22 pages of s*** talk. Worlds first launched Giga water coaster! 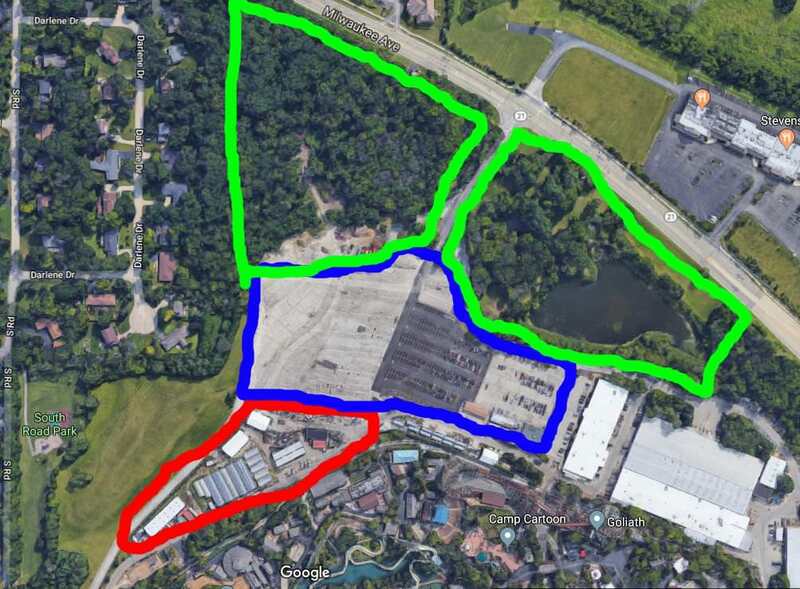 Joking aside, I was just reading the 2016 Financial report on Six Flags website and it states that Great America has approximately 30 acres of potentially developable land.... That's ALOT of room, larger than Hurricane Harbor. What land are they referring too? The Parking lot? The woods behind the employee parking lot? Because that's a huge chunk of land. Great Adventure is massive! So they've got a lot of room left to work with! These numbers are from the official Six Flags 2016 annual repot, so they definitely see 30 acres of potential land at Great America! Ok, so I think the most feasible way we can 'expand' our park is actually through Picnic Grove. In the past few years, I've seldom seen anyone use Picnic Grove for anything. Maybe two events a month. Seeing how the pathways are already(for the most part) in place, why not just open them up to the park? If all the picnic pavilion infrastructure is removed, I'm almost certain there's space for rides, shops, games, etc. 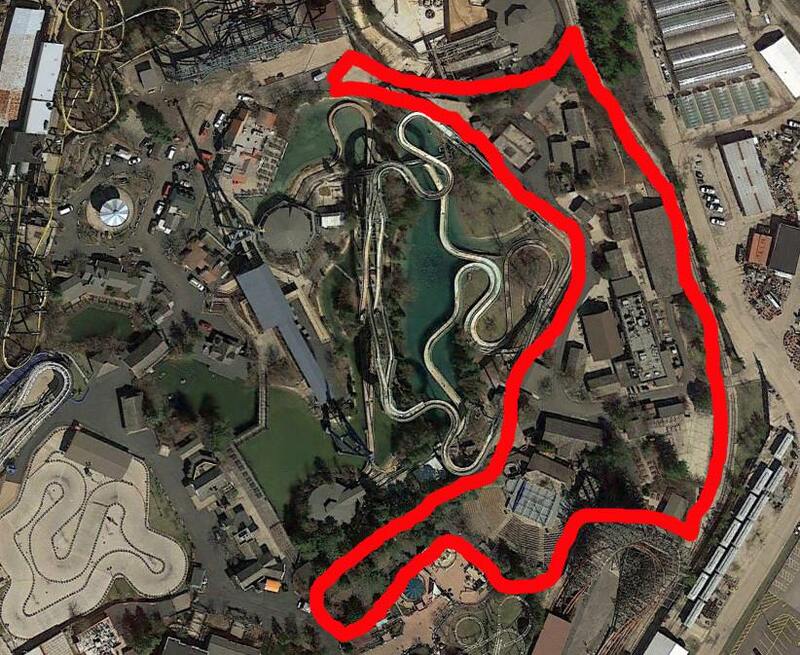 It can run from Joker all the way through Wilderness Theater, and hook back up at Camp Cartoon/Logger's Run. The red is the current Boneyard. The blue is the current Employee Parking Lot. The green is Undeveloped land that the park owns. I can definitely see the park moving the employee lot farther back(probably to the upper green area), shifting the bone yard up, and expanding into the leftover land. The Picnic Grove area is directly underneath the boneyard(and goes to show how much room there really is! ), so expansion through there can be relatively easy. I doubt we'll be seeing a lot of capital thrown into one area in one year, but if we were to expand the park, this is definitely the way I see it going. Some of you are setting yourselves up for disappointment. tribar wrote: Some of you are setting yourselves up for disappointment. I’m never disappointed in what the park does. I’ve welcomed every addition we’ve had in the past and will continue to do so. So if it’s a water park addition then I will be happy. I waited years and years for the water park to get built since it never happened on the other side of the tollway along with the entertainment complex that was supposed to go up. So bring on whatever they’re gonna do because this is my home park and I’ve been going to it since it opened and will continue to do so no matter what they do. I love this park and the fact that we get something new each year is a blessing to me. I have a new theory what if when they were looking at dive bomber meant that was a clue for the angle of the drop. But I still keep thinking it will be a water park addition as of proof by this photo. Even ignite? Be honest, would you rather get something every single year even if that meant the addition sucked? Honestly, I'd be perfectly happy if we got nothing for a year and just got part infrastructure improvements. Refurbished buildings, removal of blacktop, cleaned up landscaping, whatever. _FuryBull_330_ wrote: I have a new theory what if when they were looking at dive bomber meant that was a clue for the angle of the drop. But I still keep thinking it will be a water park addition as of proof by this photo. Where is that and why do you think that's proof? Most likely. I probably will be. I'd like to believe Six Flags would make exceptions to their thrift with Great America because they've added X-Flight and Goliath since 2012. I'm also optimistic because this nice chunk of land in question belong(ed) to the dry side (the Pictorium entrance remaining is also encouraging). That said- for me, at least, there hasn't been anything at all to get excited about since Goliath. On top of that, the people this park attracts have been steadily getting trashier and trashier. I've been going to this park since I was a kid (when Batman was new), and have plenty of fond memories. I'd like to keep them coming. The recent trajectory on all fronts is not encouraging. I'll definitely be disappointed with a water park addition. Wasn't thrilled that it was built in the first place. That's just me, though. The place is packed on any given day, so obviously there are people who enjoy it. Not sure why you think that’s proof it’s a water park addition? That is directly to your right as you’re walking into the water park. I’m almost positive that is where they brought in the equipment for the demo of the pictorioum. When the water park first opened the fences weren’t up exposing that whole side of demo site. After demo was done the fences went back up. I agree, they need to dump this "Every park gets something new every year" strategy. It's a dumb self imposed constraint. A simple change in strategy could yield much different results. Those smaller parks used to get much better numbers than they do today. This current strategy leaves them fighting over Super loops and rides that just won't encourage people to go there..... Six Flags America being a perfect example.... who get's excited about a lazy river upgrade? Come on guys they're adding scenery to the lazy river let's buy passes! Said no one ever, lol. ^ That's actually a pretty good strategy but sadly we know Six Flags would never use that strategy for some excuse but you never know.